[Blind Gossip] This scary cable TV series has become so popular that it has spawned a whole tourist industry in the small southern town where it is filmed. All the tour guides are licensed and insured and have buses and schedules and permits and a meeting place and an itinerary. Well, except for one. The father of the child star of the show started operating his own “tour.” His tour has no bus, no schedule, no business license, no meeting place. You drive your own car. 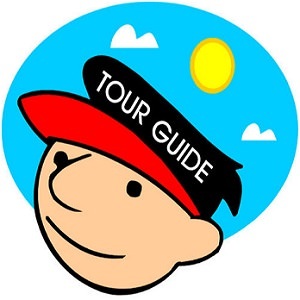 While other tour guides are operating lawfully, this guy is leading dozens of people around the town, trespassing on private property, and completely ignoring any of the safety rules the other tour operators follow. According to the townspeople, he is both a nuisance and an insurance nightmare waiting to happen. It may not be as bad as a zombie apocalypse, but it is a significant problem for them. The town has asked him to stop, but he laughs at them. “I’m the father of the star of the show! I’ll tell the producers to change locations and your town will lose!” While it is doubtful that he has that kind of clout, the townspeople don’t want to test his claims. By the way, he used to say that all the money he charges for the tours went straight to charity. However, his lack of employment made people question that claim. Now he simply says that his tours “support” those charities. Oh, and bring an extra $40 in cash if you want an autographed picture of his kid. Yes, it’s all very shady. [Optional] Should the TV Show’s producers step in to deal with this guy? Ready for an interesting SOLVED blind item? The character played by young actor Chandler Riggs has been cut from The Walking Dead! The producers very suddenly killed off his character, Carl Grimes, the son of the lead character on the show (Rick Grimes, played by Andrew Lincoln) . Chandler Riggs cut his “famous” mullet hair right afterward, so he will not be returning to the show. Let’s talk about the haircut, the character cut, and the role that Chandler’s father may have played in this sudden development! 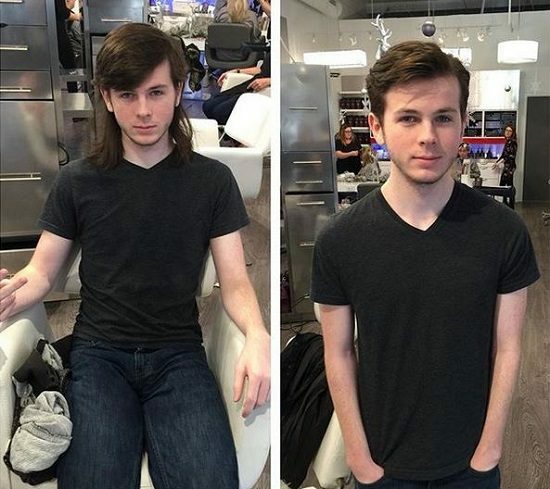 Walking Dead star Chandler Riggs cut off his infamous mullet just days after his character faced a gruesome fate on the hit AMC series. The actor, whose character (SPOILER ALERT!) revealed he’d been bitten by a zombie on the Sunday, December 10, mid-season finale, had worn the long, shaggy hairstyle since beginning his journey as the beloved Carl Grimes. Riggs, 18, has come to terms with his character’s fate, telling The Hollywood Reporter the bombshell was “story-related” and important for the future of the show. While the legendary zombie killer seems content with his fate, one person who isn’t happy about it is his father. As previously reported, William Riggs wrote on Facebook, “Watching [executive producer Scott] Gimple fire my son 2 weeks before his 18th birthday after telling him they wanted him for the next 3 years was disappointing. I never trusted Gimple or AMC but Chandler did. I know how much it hurt him. But we do absolutely know how lucky we have been to be a part of it all and appreciate all the love from fans all these years!” The post has since been deleted. Did you read that last paragraph? Ohhhhh! Daddy’s mad! See that finger that Chandler Riggs is giving the camera? That’s the same finger that the town of Senoia, Georgia is giving right back to Chandler and his father! The move to cut a popular young character from a hit show certainly does not seem logical… unless you happen to know that there may have been some other factors in the decision-making process. When you are a major production shooting in a small town, the last thing you need is for a relative of one of the cast to be ticking off the entire town. Rigg’s father was a thorn in the side of the townspeople, and a chronic headache for the producers to deal with. While we can’t say definitively that Chandler Riggs was cut so the producers could get rid of his father, the townspeople of Senoia are certainly happy to see both Riggs and his father go! Did you catch the “zombie apocalypse” clue? Good for you! Congratulations to Gemzan for being first with the correct response! Yes, the show should stop his dad if possible. Looked up his dad- he’s beyond cringe-worthy. I feel so sad for Chandler, who really is a gifted actor. It’s probably past time for him to get a professional manager instead of dad. Chandler Riggs’ dad, poor kid. Seems from his twitter and his website that the tours he runs are his only business. …well, I guess Carl won’t be meeting Lucille, personally. We already know it isn’t him or Rick. The guy said so. Yes, the producers need to step in before it becomes a legal issue. Gotta be The Walking Dead. I don’t watch the show so not sure who the child star is. What a tragic situation for Chandler. It’s not his fault that his father is like this. I don’t know the cast but the show must be the Walking Dead, there’s tons of clues and I don’t even watch it. Optional: they should but I’m somewhat doubtful, who’s going to be liable and all the other factors they will calculate will probably mean the producers will leave it up to the town. Chandler Riggs from the Walking Dead. Super lame. Although I’ve been wishing Carl would be zombie chow since the beginning of the series. Yay for my first post! Lol, what would the show be without that? This is “Coral’s” dad from TWD. The town is Senoia – my hometown! Carl’s dad. Sorry, can’t remember the kid’s name. Optional: Who do you think Negan killed? (Ok, that’s not the optional, but it’s my optional). Glenn. I think the producers need to have a ” come to Jesus” meeting with him before he gets his kid’s character killed off the show….. The producers should kill off the kid. Problem solved. LOL! Yeah they should step in. This is a wild guess, as I don’t watch the show and I had to look up the kids name. Producer’s should definitely step in, there’s nothing worse then a Diva parent and this sounds dangerous. Chandler Riggs from Walking Dead. Disgusting father. Yes, they’re renting locations, not buying them; plus it makes the whole production look bad. Stranger Things filmed in Georgia. I’m going to guess Caleb McLoughlin for the kid. The parent of a child star is an unethical chances? Stop the presses!! Sounds like walking dead, so the kid would be Carl, but he’s a long way from beinn”the star” of the show. If anyone is its Andrew Lincoln, but really it’s an ensemble piece. Optional: Probably. This is a liability and/or public relations nightmare waiting to happen. The Walking Dead and Chandler Riggs (I think that’s his name?). Sad to hear that. His kid works hard. He not only does the show, he’s on the con circuit. I’ve seen him at cons, and he’s there all day to promote himself and the show. His dad sounds like an ***hole. The only Walking Dead child star is Chandler Riggs. The father of the kid who plays Carl Grimes’ son in The Walking Dead? The Walking Dead, Chandler Riggs. Daddio better watch it, the kid’s going to be legal soon, and the gravy train might stop. Chandler Riggs’ from “The Walking Dead”. Father is William Riggs. yeah, they need to do something. bad enough Spoiling Dead has all but confirmed who has a “date with Lucille”, and obnoxiously BOASTS about it, but this guy sounds like he may also be their main “inside source”. Several pics I saw, the actors KNOW they’ve been papped and it’s by someone they see regularly. Who else could it be? AMC and Kirkman need to shut him down or KORL is walker chow. The Walking Dead, Don’t know the name of the dad or child actress. The Walking Dead, of course. Should the producers step in to deal with the idiot father? Duh, YES. As soon as I read this, it screamed “Walking Dead”!!! 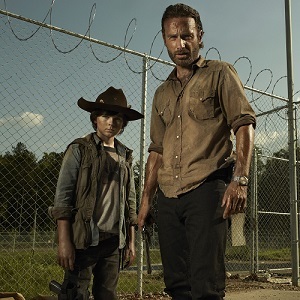 so TV show being the Walking Dead and child star… Chandler Riggs? Father of the actor that Carl (Rick’s son).